But an edifice is anything but permanent; it is subject to disappearing at the whims of humanity, the power of the elements. The aliveness of an edifice is found in the metaphors and stories that shape human history. A place can represent possibility. For example, the Kotel, or Western Wall, at the site of the Second Temple in Jerusalem has served as a symbol of our hope to be a free people in our own land for centuries. As a place, now in our own nation, it is a location for prayer and has become a place of struggle — between an evolving and stagnant Torah. One of the names for God is “Makom,” “Place.” Another name for God is “Ehyeh Asher Ehyeh,” “I Will Be What I Will Be,” noting that God is always-in-process. God contracts to make room for creation. God evolves and changes. Holiness is not stagnant. Nor is it ossified in stone. The Kotel as a symbol out of reach, prior to Israel’s capturing the Old City in 1967, felt more holy to me than it does now in our hands, because then it made us all partners with God in imagining possibility. I hope one day the Kotel becomes a Makom/Place of contraction-and-growth in partnership with Makom/Asher-Ehyeh, God/Place as ever-changing. My family, who live a half-hour’s walk from the Kotel, was created through birth and adoption. Our daughters were born to us; our sons were adopted from Ethiopia. Once we were matched with our youngest son, then four years old and living in a large group home in Addis Ababa, I looked at his picture and wondered how this one child, of all the children waiting for families in the whole world, became ours. The rabbis describe God’s choice of the Holy Temple in Jerusalem in this way: Revelation could have happened anywhere, but after God chose the Land of Israel, all other lands were eliminated. All of Israel could have sufficed, but God chose Jerusalem. All of Jerusalem could have served as the Holy Place, but God singled out the Temple. As we considered adoption, we settled on a country, Ethiopia, at which point all other lands were eliminated. Then we settled on an orphanage, after which all other orphanages were eliminated. Then we settled on a child, and all other children were eliminated. I called the adoption agency and claimed the boy named Kedir. When I read this text about the Temple 12 years ago, I was moved by the sense of destiny embedded in the inexplicable. The Temple had been chosen by God simply because it was. Over time, however, I am struck by the description of the Temple not as a holy edifice, but as revelation — merely a historic representation of an eternal unfolding. Our son, too, was in a place that physically represented a moment in the unfolding of our new, ever-changing family covenant. His name, Kedir, is the Arabic word for “pottery,” which is similar to the Hebrew, kadar. There are many rabbinic references to God as Potter and humanity as the vessel God created. But that metaphor does not allow for metamorphosis, for what we hoped would emerge from the re-creation of our family. Until adoption, by necessity, this child had been like pottery, shaped by the loving hands of God in the form of a caring aunt, a charity organization, and the staff of an orphanage. But with a shift of only two Hebrew letters, his new name, Zamir (song), would symbolize his transformation from passive vessel to active singer of his own song in the loving Abramowitz-Silverman choir. I think of our family as a makom kadosh. This is not because we come anywhere close to perfection, but because we are not bound by the structure of DNA. Rather, we are bound together in our openness; Nihyeh asher nihyeh — We will be what we will be. This story "Holiness Is Not Stagnant" was written by Susan Silverman. Rabbi Susan Silverman is the founder of Second Nurture: Every Child Deserves a Family. 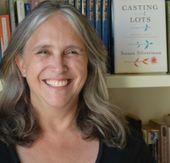 Her memoir, Casting Lots: Creating a Family in a Beautiful, Broken World, weaves together adoption and Judaism. She is also a founder of Miklat Israel, an NGO formed to assist Israel in creating a just, compassionate, and sustainable solution for its asylum seekers. She and her spouse, Yosef Abramowitz, have five children and live in Israel.